If Web 1.0 was about online access and Web 2.0 is about social nets, Web 3.0 will be coring down to content that really matters. ~wrote Martin Smith in the post, Curation - The Next Web Revolution. As mentioned by Harold Jarche in the slide share presentation, NetWork, the internet changed everything—in volume, velocity, virtualization and variability. And nowhere is this more evident than in the content being created every second of every day. 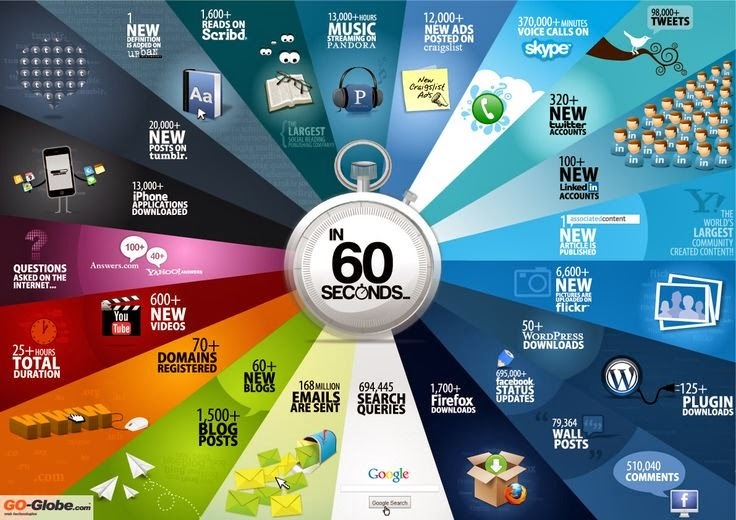 Take a look at this infographic which captures what gets created on the Internet every 60 seconds very nicely: http://pinterest.com/pin/247698048225202468/. 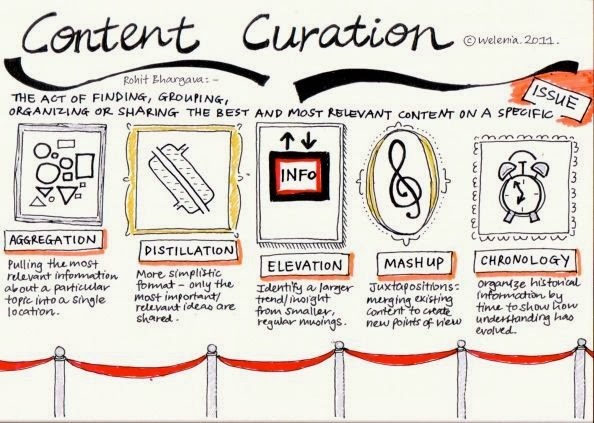 Not surprisingly, curation has become the next buzzword after social business. With content coming at us with the force of a tsunami and the fury of a tornado, curators seem to have become our saviours—our sense making guide. One post out of five I have been reading in the past few months seem to be associated with curation or its close cousins—aggregation and filtering. Even as I read, I was tempted to apply some of the curation strategies and put together this post. I like to build some context around the links because—who knows—in the Internet world, a working link today can be a dead link tomorrow. Curation today takes on a new meaning in the context of technological affordance, information abundance, diminishing attention, hunger for contextual and timely information, and constantly shifting, globally linked landscape. In this complex and chaotic world, making sense can only be a constant endeavour, pattern matching a crucial need. And this is what today’s curators do—aided and inspired by technology. I will not delve into the root of curation as traditionally practiced by museum curators and librarians, which conferred on them the status of an expert. And those thus anointed went on to shape the taste and understanding of humans who arrived at their domain. For a deeper understanding of the rise of curation, I recommend that you read Steven Rosenbaum’s Curation Nation. A little reflection reveals that curation is a way of life for all of us—we are all curators. How we put our curation skills to use is what makes us unique. We are curating when we pick the books that will adorn our shelves; we are curating when we choose our furniture; the store keeper is curating when s/he selects and arranges the display. We are also curating when we choose what to share with our Facebook friends. And in each type of curation, what comes across are unique perspectives, a sense of pattern and a representation the curator wants the world to see. But I digress. I want to focus on curation and the need we feel for it today and some of the skills that make for a curator. I have also referenced some of the posts and articles that shaped my understanding and thoughts around curation. In the September of 2009, Rohit Bhargave wrote a post called the Manifesto For The Content Curator: The Next Big Social Media Job Of The Future? . I stumbled across this quite recently. And one of the most telling sentences that leap out from the post is this: “…By some estimates in just a few years we will reach a point where all the information on the Internet will double every 72 hours.” While the magnitude escapes the capacity of our mind’s ability to comprehend, this does beg the question: should we focus on creation or curation? How do separate the wheat from the chaff? How do we make sense? Bhargava goes on to define a Content Curator thus: A Content Curator is someone who continually finds, groups, organizes and shares the best and most relevant content on a specific issue online. This then is an individual, who makes sense of the deluge and presents it in a manner that is coherent, easily understood and relevant. 1. Aggregation: Aggregation is the act of curating the most relevant information about a particular topic into a single location. 2. Distillation: Distillation is the act of curating information into a more simplistic format where only the most important or relevant ideas are shared. 3. Elevation: Elevation refers to curation with a mission of identifying a larger trend or insight from smaller daily musings posted online. 4. Mashup: Mashups are unique curated juxtapositions where merging existing content is used to create a new point of view. 5. Chronology: Chronology is a form of curation that brings together historical information organized based on time to show an evolving understanding of a particular topic. Here’s a visual representation of the model above taken from Beth Kanter’s post: Best Practices for Content Curation for Nonprofits at Social Media for Nonprofits Conference. Curating is also defined thus: … I mean curating in the sense of organizing, editing, displaying, highlighting, captioning, commenting on, and all of the activities you'd see associated with telling a specific story from your point of view…~ in the post, Curating Information as Content Strategy. Aggregation is perhaps the most frequently seen manifestation of curation because it is easier to do than the rest. Aggregation can be automated by setting smart filters and alerts. But while useful, it is lower on the value chain. However, aggregation can be infused with greater depth as described in Is Content Curation the New Black …many of the world's top websites and blogs are largely curation-based. Lifehacker.com is a great example. There's a smattering of their own stuff, a more substantial article mixed in here and there. But it's largely about curating the need-to-know info in the world of, well, life and tech hacks. 1. Real-time curators need to bundle. 2. Real-time curators need to reorder things. 3. Real-time curators need to distribute bundles. 4. Real-time curators need to editorialize. 5. Real-time curators need to update their bundles. 6. Real-time curators need to add participation widgets. 7. Real-time curators need to track their audience. It is difficult to deny anymore that curation is the need of the hour. Whether we depend on others to provide us with curated content or we decide to become curators in our area(s) of expertise or interest, the need for curation as a sense making and PKM activity is undeniable. This of course means that we should at least be familiar with the basics of curation and the technological affordances. The next natural question then is how does one begin to curate? And here I found Tim Kastelle’s post, Five Forms of Filtering useful. Filtering as explained in the post, takes place in two ways—the judgement-based or human and the mechanical. Judgement based filtering occurs at different levels—Naïve, Expert and the Network. Mechanical filtering is driven by Heuristics and Algorithms. Our interest and passion can take us from being a naïve filterer to being an expert. An expert on a topic may use any or a combination of the curation forms mentioned above—aggregation, distillation, elevation, mashup and chronology—to present their readers with a certain perspective or overview. This is of course similar to the PKM model suggested by Harold Jarche. For effective curated output, pattern recognition is essential. A good curator sees patterns before others, can connect the dots in seemingly disparate pieces of information, and can distinguish between an important trend as opposed to a passing fad. The one critical difference between PKM and deliberate curation—as I see it—is that he former is inward focused even while taking place in a networked world. The latter is deliberately outward focused with the intent of presenting a perspective or an insight or a trend to others. The steps involved are similar while the desired outcome may be different. How do the skills of a curator apply in an organizational context? More than ever before, as we know. In globally distributed and networked organizations engaged in doing complex work, where exception handling is likely to be the norm, it is crucial for information flow to be transparent and to have folks who can spot the patterns, connect the dots and provide that key insight which keep an organization on the cutting edge. They may or may not be officially conferred the title of curators. But the need is irrefutable. Probably the biggest challenge facing organizations today is not the lack of data creation, but the lack of someone who can connect all the floating dots—inside and outside the organization—that lead to meaningful decisions. While some aspects can be automated—using analytics—it still requires a human curator to recognize patterns and present the output. Who are likely to be playing the role of key curators in an organization? Most likely to be the community managers! With organizations going the social business route and investing in a social platform, community managers will soon become an essential role. And community managers are the best placed to play the role of curators as well. One insight I gleaned from this post by Bertrand Duperrin: Are curators the missing thing in enterprise 2.0 approaches? Curators are focused on information flows without thinking they’re leading or managing any community. From which I draw the inference that curators need not be community managers, but community managers should ideally have curation skills or work closely with curators to build a successful community. As Clay Shirky said here: Curation comes up when search stops working…[and] when people realize that it isn't just about information seeking, it's also about synchronizing a community. More on the specific skills we need to develop to be effective curators in my next post. A very good blog post: solid arguments and excellent tips on curation. Thank you for visiting my blog and for the kind comment, Cristina. I do hope you will keep coming and will be sharing your insights and suggestions. I would also be very happy to know what else you'd like to see in this blog. Excellent! What have you been up to lately. I am the founder of Internet Billboards and would love to have you curate there. Do you use Scoop.it by any change, The free curation tool? Thanks for your kind comments, Tom. To answer your question, I do use Scoop.it though not as much as I use Paper.li. I am exploring various curation tools and trying to find the best mix. I use different tools for different purposes. Sahana, Better late than never on my comments here. You did very well in curating a valuable piece on curation itself. I was particularly drawn to your comment "They may or may not be officially conferred the title of curators. But the need is irrefutable." This is a critical point as in the short-term I see few midsized orgs creating a job description for this role and yet, the ability to do it and have it done will be critical. I whole-heartedly agree that Community Manager(s) will be undertaking this position almost unconsciously and likely with little recognition for their work. You also hint that it will be "folks" doing this work (plural). I see 2 types of CMs evolving. One more focused on the content and making content more understandable/digestible..the other focused on the community beyond the content. For example, here in the states we see two sportscaster in the booth during sporting events - one sportscaster provides the facts, an expert who can see and anticipate what the audience will want to know. The other, the color commentary, one who provides the emotional angle so key for connection to the event as a whole. Food for thought. Mark, thank you for your comment and for the very thoughtful points. I completely agree with you that the role of the CM itself will diversify. It will happen almost without intent initially and will then evolve in the ways you have mentioned. My fear is that while marketing is beginning to consider content strategy as one of the keys to attracting customers, within the enterprise the need is not yet clearly defined. I do believe that curators--they may come from anywhere in the enterprise but most likely to be CMs--will bridge the gap and spot the pattern between disparate information. This role will increasingly become important--whether officially recognized or not--as these folks will be the ones to spot emerging trends, patterns in exceptions, edge cases that could be important to the core...you get my point. I don't yet know how many organizations will see the importance of such a role in their business strategy but eventually they will have to. Else, too much valuable insight, knowledge and lessons and learned will pass by leaving nobody any wiser.